Characteristics: This is the ancestors’ death anniversary of the whole nation. At the same time with incense-offering ceremony at Hung Temple in Phu Tho Province, sacrifice-offering ceremonies at Hung Temple in Ho Chi Minh City, Nha Trang and other provinces are aslo celebrated. Legend: 18 generations of Kings Hung established Van Lang State, the predecessor of the present – day Vietnam. – The procession of 3 local communes from the communal houses to the foot of the mountain. – The incense offering ceremony. The festival begins with a palanquin procession performed by three villages of Co Tich, Vi Cuong and Trieu Phu. 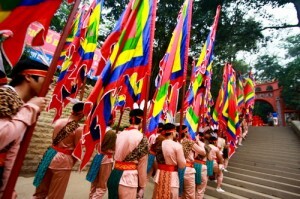 The procession carries bamboo elephants and wooden horses symbolizing the submission of animals to the Kings Hung and the wedding of the Mountain Genie and Princess Ngoc Hoa. Banh chung (square sticky rice cake) and banh giay (round sticky rice cake) are indispensable offerings in the procession in order to honour the merit of the Kings Hung who taught people to plant rice and to remind people of Lang Lieu who invented these cakes. The children of the Kings Hung throughout the country converge on the temple to offer incense. The procession includes the state representatives, one hundred young men and women in traditional costumes symbolizing ‘children of the Dragon and Fairy’ and pilgrims. The procession marches are followed by a Xoan singing performance (a kind of folk song of Vinh – Phu region) in Thuong Temple, ca tru (a kind of classical opera) in Ha Temple, and other activities including bamboo swings, nem con (throwing a sacred ball through the ring), cham thau (beating bronze drum), dam duong (pounding rice).